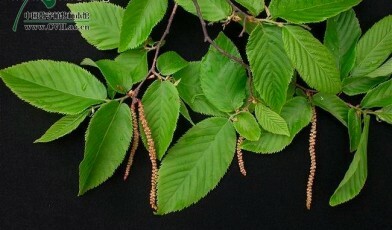 Ostrya rehderiana is endemic to China and found only in the western part of Tianmu Mountain (Mount Xitianmu) in the Zhejiang Province. It is a deciduous tree which can grow to a height of 21m. Though previously common in the woods of Tianmushan, only 5 known trees remain in the wild, within an area of only 0.04 km2. All of these trees have suffered damage to their branches or bark. It is thought that this species has experienced a great loss of numbers due to deforestation and the planting of bamboo. The remaining trees are threatened both by human disturbance and by competition with other trees and bamboo, particularly for light. Although the area where these trees live is now within a nature reserve, the population does not appear to be regenerating naturally. Another threat to this species is the low genetic diversity of the remaining 5 trees. This decreases the species’ ability to adapt to changing conditions meaning it is at risk of extinction in the event of a natural disaster or disease. It is not widely cultivated in botanic gardens so there is a risk of losing this species completely. There are currently 11 living specimens at The Arnold Arboretum of Harvard University in the U.S.